It seems a little fitting that the first site to give us an indication of when we'll get our hands on the Nexus 4 was also the first site to leak its name. According to a device listing page that has now been pulled, the newest, shiniest, sparkliest Google hardware may be available pretty soon after the announcement next week. The Carphone Warehouse says that pre-orders will ship on October 30th. Dang, that's fast. Of course, don't take that as canon, since there's a lot of suspicious stuff going on in this page. 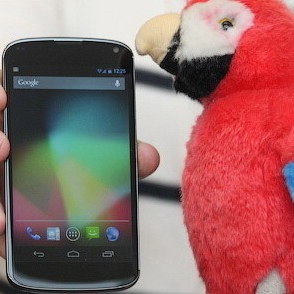 For starters, the press shot of the Nexus 4 being used here is the same one we spotted yesterday on evleaks. You know, the one with the weird status bar and artifacting that might indicate this was just some guy's mockup. Then there's the claim of a 360° camera. Sure, Google has them, but it doesn't look like they'll fit in your phone. 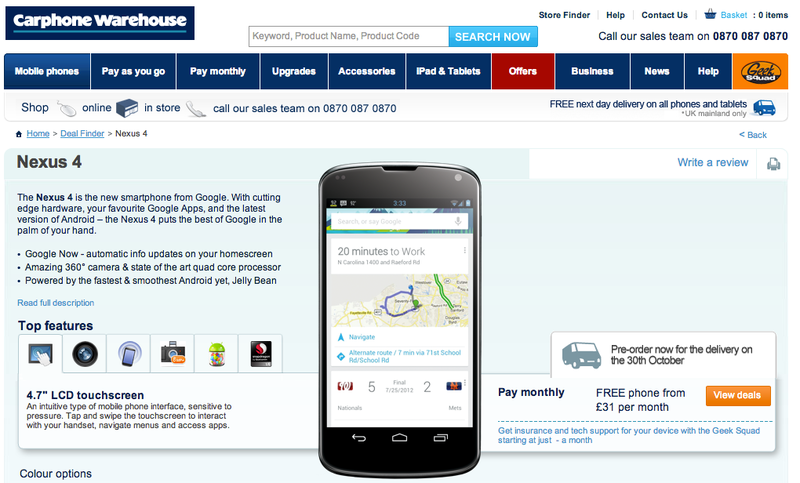 Still, Carphone Warehouse got the name right. At least, we're assuming it has based on the evidence. Google could pull a fast one on us, but so far it looks legit. Until we hear from the horse's mouth on Monday, though, I wouldn't count on seeing this device ship this month.